I've created a trial account and downloaded the app on an iPad. 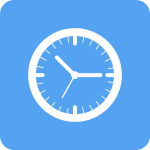 We want to use the iPad as a timeclock for the office; however, when I log into the app, it only shows clock in/out for me. On a Windows PC, I can clock in/out as any user with their ID's. Can the iPad app work the same as the Windows application? Is there a bulletin board or discussion board in the Zip Schedule app to push announcements to employees?